Yesterday, I wrote about the Olympus E-520 digital SLR. I shot with long lenses during the tennis event, but afterward, I wandered the Stanford campus with some of the other glass Olympus makes. A real eye-popper was the Zuiko Digital ED 8mm F3.5 Fisheye. It sells for about $790 US. It has a 180-degree angle of view, and is the equivalent to a 16mm lens on a 35mm SLR. What's wild about the lens, other than the shots you can take, is that you can use a doubler on it without vignetting. Crazy. This image was captured with the 8mm mounted on the E-520. I was standing at the top of the swim center. 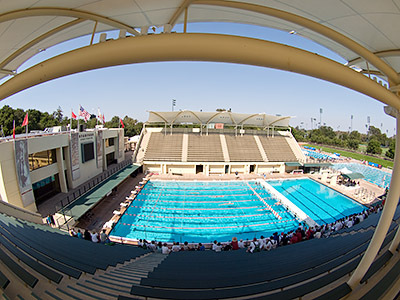 The lens recorded everything in view, from the overhead structure for shade, to the stands, to the pool itself. I'd love to get my hands on this lens again and take it to Beijing next month.